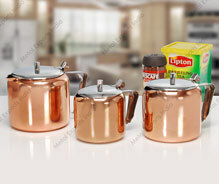 These enchanting and exciting products come with copper plating from the outside with interiors of fine quality stainless steel that provides for optimum usage support. Finding wide usage in different kitchen applications, these also provide for a classy finish appeal and help in enhancing the decor values of the kitchen and serving areas. 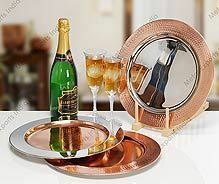 The use of quality copper and stainless steel also prevents these from tarnishing as well as helps in maintaining its finish beauty for years to come. 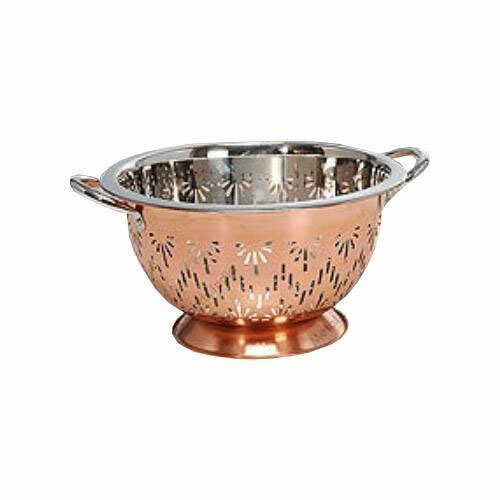 A perfect decorative accent to your kitchen or table, this colander is suitable for everything from draining pasta and seafood to rinsing fruits and vegetables. The sturdy handles provide perfect grip and ease of cooking. Special lacquer coating keeps it pristine for looks that will last lifetime. 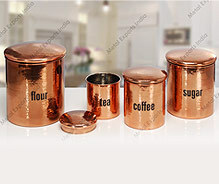 Keep baking goods, snacks, tea, sugar and coffee beans fresh and handy with this handsome set of copper canisters with hammer pattern and copper. 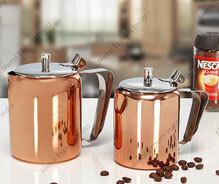 Crafted from heavy weight copper, the canisters' construction is solid and durable. The foursome includes matching lids with broad rim. Sunflower colander is artistically beautiful yet functional enough for draining pastas or rinsing sea foods, fruits or vegetables. 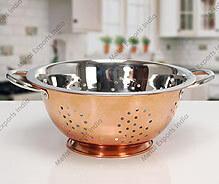 This colander is attractive enough to serve as a display or centerpiece. Comes with protective coating that prevents tarnishing. This beautiful water pitcher fuses transitional form with traditional style for an uber class look. Looped handles provide perfect grip and the protective lids prevent spillage of water. 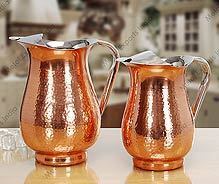 The hand hammered water pitcher is perfect for watering accent for those seasonal arrangements. A perfect piece of conversation, this functional coffee pot keeps tea or coffee hot. Felt-lined, copper-anodized stainless cover fits over a sturdy pot. The coffeepot includes a large brew basket, and its stay-cool handle provides a comfortable grip. This premium tea pot features a sophisticated styling with a functional design. The beauty of dimpled copper is not only for looks, but also adds to the conductivity and longevity. Rolled lips of the pot provides greater stability with Pot Lifter and reduces the pots’ tendency to warp. An elegant table top for special occasion, this charger plate is perfect for displaying your favorite dish. The hand hammered finish with lacquered coating prevents tarnishing for lasting beauty. Beautifully decorated rims makes it a perfect piece of conversation.